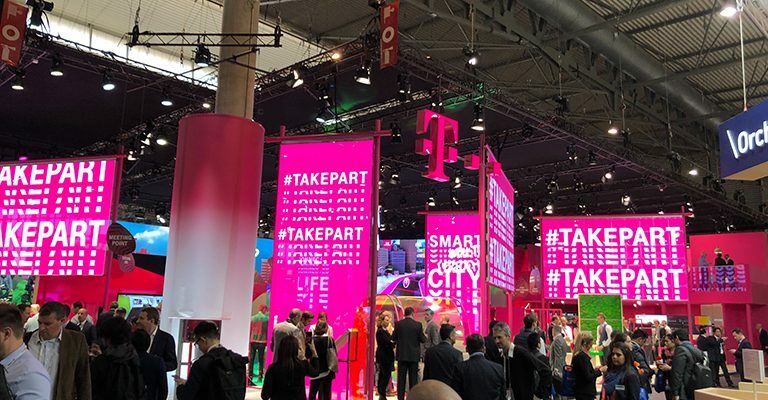 Two interactive, digital installations for two prominent clients at two international trade fairs: We are expanding our customer portfolio in the field of trade fair and live communication with Deutsche Telekom and the US financial services provider Capital One. 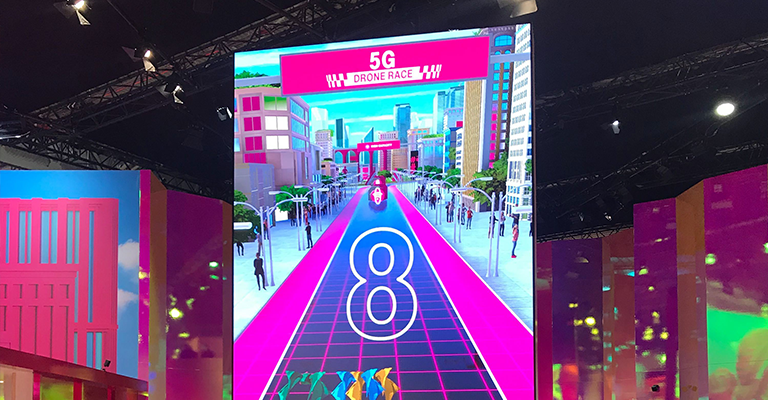 In cooperation with Meiré and Meiré, we developed an interactive multi-user racing game to promote 5G for Deutsche Telekom's appearance at the Mobile World Congress in Barcelona at the end of February. Trade fair visitors use their smartphones to navigate virtual drones through different levels and worlds on a 5-meter-high and 3-meter-wide screen. Users learn more about Deutsche Telekom's involvement in the 5G area and the benefits of new mobile communications. Together with our new client Capital One, we were on site at the South by Southwest, in Austin, Texas. In collaboration with Mirror Show Management (MSM), we were creating a digital installation for the US financial services firm, based in McLean, Virginia, that allows visitors to configure their 'surreal dream car' on fixed iPads. There are no limits to the imagination: anything from the body's shape and color, to tires and rims, to various engines, anything is allowed - even if the car looks like a 'Madmax', 'The Fast and the Furious' or off ,The fifth Element'. The result is then staged and presented on a 6 x 2.5 meter high LED wall. 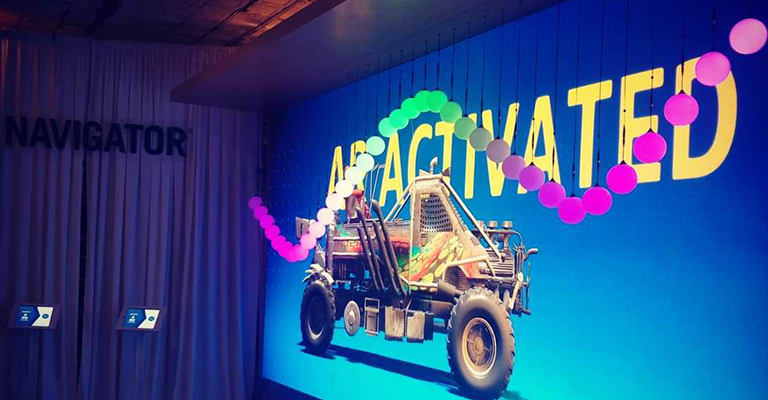 42 vertically moving LED spheres serve as visual support in front of the wall and reflect in real time the silhouette and paint color of the newly configured 3D car. The digital is linked to the real world. Based on the configuration, the 'auto-designer' actually gets suggestions on what 'real' car he could buy and finance with Capital One. The message: Capital One helps to realize every kind of dream. Both exhibits are so-called 'micro amusement parks' - spatial installations and interactive applications that primarily aim at entertaining the guests and, in addition, playfully convey educational and informative content in an effective way. We have already implemented numerous micro amusement parks for customers such as the city of Ulm, Deutsche Börse and Gatorade. In the near future, a virtual permanent exhibition in the Port of Hamburg will be opened on behalf of DuMont under the name 'Discovery Dock'. For the exhibition area of Deutsche Telekom, our Cologne team led by Kristian Kerkhoff, Managing Director and Managing Partner at the Cologne location, was already active at IFA 2018 last year and also presented interactive installations - including an interactive pinball table for which more than 4,000 enthusiastic players accepted long waiting times.